Posted June 4, 2018 by The Rapid & filed under Events. Are you ready to challenge yourself to a healthier commute and win bragging rights? 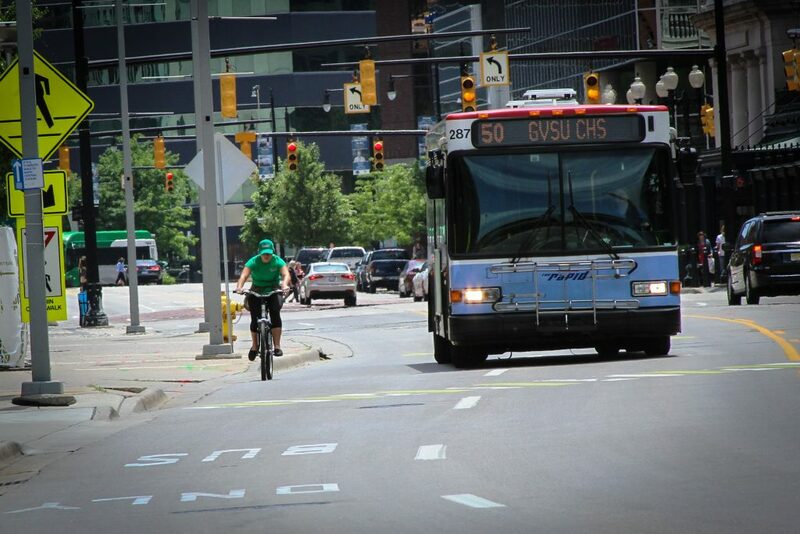 Grand Rapids seventh annual Active Commute Week is geared up for another year of encouraging individuals and businesses to give active commuting a try. This year, more than 40 employers are currently enrolled in the 2018 event that kicks off Monday, June 11 running through Friday, June 15. The goal of Active Commute Week is to raise awareness about the health, economic and environmental benefits of active travel. This week is a chance for individual participants and teams to earn points for using active transportation, including bicycling, walking, riding The Rapid, carpooling, running, long-boarding or inline skating. The participating list of local employers planning to encourage their employees to walk, roll and ride during Active Commute Week include Brewery Vivant, Williams and Works, Grand Valley State University, Cascade Engineering, Spectrum Health and OST. There are also more than 200 individuals currently signed up to participate and log their commutes. If you’re looking to get active and join in the healthy competition, it’s fast, easy and free to register! Simply complete the individual form and please note your organization when you sign up if it’s applicable. You will be notified by The Rapid when your account is ready. Participants can track trips on the West Michigan Rideshare website. Bike to Work Day Pit Stops: June 15th, 7:00 a.m. – 9:00 a.m. Grab snacks, swag and add some fun to your commute on Friday, June 15! Organizations compete for best support station for those participating in an active morning commute. Check out the list of pit stops to visit for your Friday commute. Bike, bus, or walk to meet up with other active commuters to wrap up of Active Commute Week! Celebrate your activity and boast about your awesome commuting skills. Door prizes will be up for grabs and Active Commute Week Challenge and Pit Stop winners will be announced. There’s more than just a pat on the back involved in your success as an Active Commute Week participant. Individuals and employer teams will be awarded for their active commutes based on who logs the highest number of total trips and the highest number of total miles for walking, cycling, riding the bus and carpooling. Prizes include $100 Meijer gift cards, bus passes, bike helmets, and more! It’s not too late to sign up! Register here.